Featuring Dark Passions nail appliers at Season Of The Witch, Kosmetik makeup hunt prize for Birthright and Slipper Originals rings at 68 Main event. Please look for all credits and closeup below. 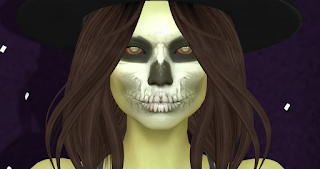 ■ Makeup - Kosmetik by Merredyth Resident - Facepaint Fright Hunt Prize for Pulse Games Birthright, open until October 31. * Catwa appliers gift, hud has 6 options ‖‖ Birthright is an interactive horror game that has many hunt prizes, you can participate by going to the location and buying the hud of 50L. 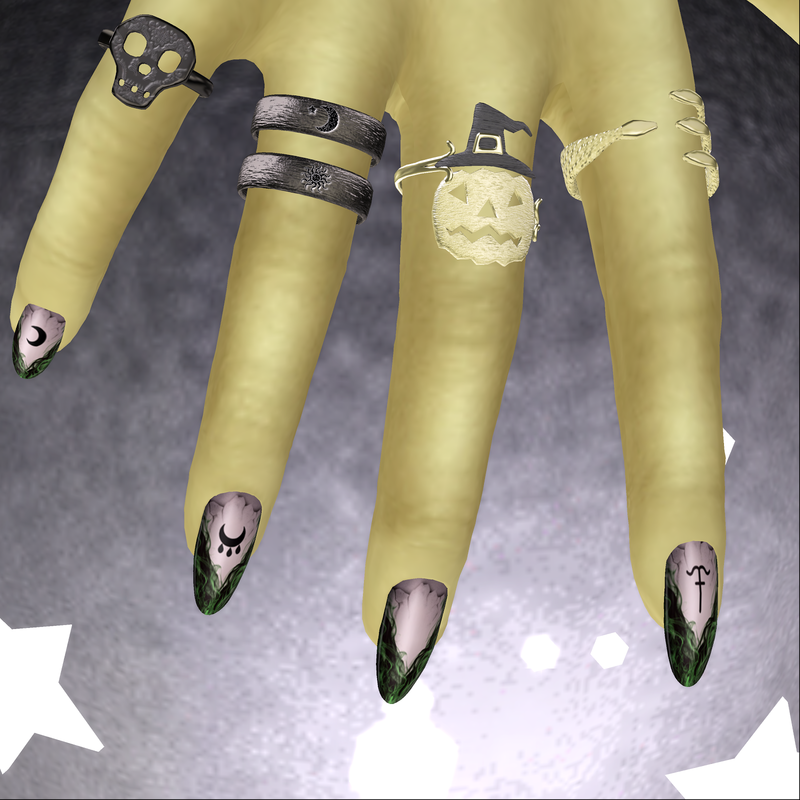 * Witchy Ways comes in 2 versions of colors each with 5 options for finger and toenails ‖‖ Choice between different Wiccan symbols and various combination options or choose the color with magical energy tips without the symbols ‖‖ Compatible with Maitreya/Omega/Slink hands for 275L per fatpack. ■ Rings - Slipper Originals by EllePolygon - Clarise Bento Rings @ 68 Main Event, open until October 25. *Rings for left and right hand compatible with Maitreya and Slink hands ‖‖ Hud of 6 metal colors ‖‖ On/Off option and color change for each ring, 199L. ■ Bento head - Catwa by Catwa Clip - Catya. ■ Skin - Amara Beauty by Shantia Soulstar - Joanna for Powder Pack October. 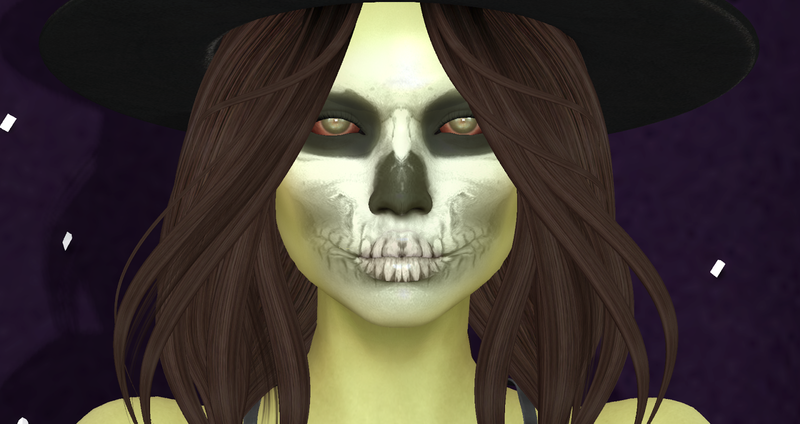 ■ Eyes - Izzie's by Izzie Button - Zombie Eyes for Powder Pack October. ■ Hair & Hat - Besom by Kattington - New Girl. ■ Props/Pose - Astralia by Astralia - Murder Telling Rare @ Epiphany, open until November 15. ■ Lights - Half Deer by Halogen Magic - Fallen Stars @ Panic of Pumpkin, open until November 4. ■ Photography tool - Lumipro by Stefan Buscaylet.